After the ride most of us headed over to 23rd Street Brewer. Sunday they had this Fish Bowl special. Get 60 oz of any house brew for $6.00. That sounded like a deal to me. I can tell you this. 60 oz of beer is a heck of a lot after an afternoon of riding. Well, at least it is for me. Doug, Dan and most everyone else finished theirs. I got about 1/2 done and called it. Thank you Bill for a great ride. And thanks to everyone else who joined in the fun. Besides a fun ride, I finally found out what was squeaking on my Giant Anthem. Darn squeaking was driving me crazy over the past month. I replaced all the bearings and bushing, replaced the shock (I stole Christopher's new shock off his new Anthem so do not tell him...), cleaned and tighted everything and put a new set of Crank Brother pedals on. I get on to start tonight ride and the creak is still there. Only now is was louder than ever. During the first lap my crank felt like it was going to come off. Turns out the insert and outer shell of my left crank arm was causing all this noise. That was the good news. Now I just need to find a crank set for Saturday's Bone Bender Training ride #1. I wonder if I can talk Carolynn in doing this event on the tandem??? Yes it is only January here in the Midwest, but Triathlon season has official begun with today's Mission Indoor Triathlon. I do believe this is the earliest triathlon I have have done and that counts when I lived down in Florida. This is the 3rd year for this event which grew to 81 racers. Not bad for an indoor triathlon in the dead of winter. The event is organized by Amy Richards and the Sylvester Powell, Jr. Community Center. Everyone did a great job and I highly recommend it. We need more of these events to do during the winter. They are great motivators and help to keep us all sane. Today's event was based on the distance you completed each discipline which was a first for me. I entered the regular triathlon which was a 10 minute swim, 30 minute bike and 20 minute run. All three event took place in the steamy hot indoors. About 10 min into the bike I was wishing it was outdoors. I will take 45 degrees and raining over indoors any day. The swim was held in a 23 yard pool which made flip turns very important. However, I can not do flip turns :-(. After today I think I am going to finally learn them. The water was a little warm, but at least it was very clear. I focused on a strong push off and my technique today. One thing I have learned is swimming is all about gliding, body roll and staying streamlined. All I did very well today and got in nearly 600 yards, which looking at last years results would have put me right near the top. The cycling leg was on spin bikes which I have no experience on (I prefer to ride outdoors no matter the weather). Not a real fan of these but contrary to what Kevin Collins told me the seat was actually comfortable. I think I made a mistake and did not use enough resistance. They guy in charge of the bike leg said your RPM's was all that counted, but I think I should have cranked down the resistance some. All I know is I was spinning like a fool at over 120+ rpm and going no where. I do not know if that would have helped my total mileage or not. Ended up with 15.4 miles in 30 min and about 10 oz. of sweet. Does anyone know if these spin bikes take into effect the watts you are putting out to get distance? Run leg was on a treadmill. I wish they let us run on the indoor track like the JCC Indoor triathlon does. The track is much better, well that is until you start to get dizzy from running in tiny little 1/16th mile circles. Run leg was o.k. with 2.9 miles covered in 20 minutes. I was hoping for at least 3.1 and a 19 min 5K, but the heat was killing me. Maybe next year. After today triathlon I am looking forward to a nice cool gravel road ride down in Spring Hill. Great turnout for today's Paola Gravel Grinder. The day started with very thick fog, which never really went away during the ride. Despite the conditions including very muddy roads and limited visibility due to the fog we had a record turnout and a great time. Thanks to Randy Rasa for hosting this awesome ride. Now I just need to clean my bike again. I just got it all cleaned after yesterday's Epic Cross. Where is Roger when you need him???? Some pictures from our ride. Cross Season is Finally Over. Today was the Epic Cross race and final round of Series 60. I'm kind of bummed that it has officially ended. I have enjoyed the last couple of weeks being able to race cross and really want to thank Mark Thomas for making that a reality. Everyone involved did a great job and put in a lot of work to make these events happen, especially with all the snow we have had. I was hoping for a good showing today as I really felt good yesterday. Today was a different story. I had some serous nausea for the better part of the morning. I do not know if I ate something bad or what. Hopefully I do not have some crazy parasite living in me. Christopher was watching a show today and it freaked me out seeing the things that some people have living in them. Anyway, back to the race. About noon time I wasn't even going to go, but after Carolynn gave me a Ginger Ale. Afterwards, I felt well enough to give her a try. Sometimes the body does strange things and even when you feel down you can have a good event. Today's course was muddy as expected. Throw in a lot of snow, frozen ruts and some crazy sections with what appeared to be small icebergs. You needed speed and momentum to navigate today's course. I had neither of these for most of the event which made for a long race trying to work my way up from a horrible start. After several laps my stomach settled down and I was able to pickup the pace, but it was too late to try and bridge up to Matt, Rob and Chris. Both Matt and Chris were having a solid ride and Rob was having a excellent ride. I saw him up there riding very strong. A special thanks to Roger for washing my bike after the event and for making fun of me. I really appreciate it. Here are some pictures that Carolynn took of the Men's Cat 3. She is becoming quite the photographer. First up was the 5th Annual Buffalo Trail Run. If I am in town I always participate in this Rusty Collins produced event held at the Parkville Nature Sanctuary. Always a good time and this year was no different. Conditions for this years event matched the 08' version when we had snow and bitter cold temps. Only this year there was a heck of a lot more snow. I lined up towards the front of the field in hopes of staying out of trouble and getting to the packed down trail in the front. The course was about half packed trail and the other half was deep snow. Very hard going for this guy. I handed the packed section much better than the deep snow. At times it was a foot or so deep and some sections were nearly knee deep when there was a snow drift. First two miles I kept the leaders in site, but after that I just ran my own race and tried not to run too hard and save something for this afternoons cycling leg. I was glad to see the finish because my legs were toast. Running in that deep snow really took its toll on my quads due to high steeping through the stuff. I ended up doing well still and earned a cool award and frozen chops. After a quick cool down I headed home to eat lunch, pick up Carolynn and head to Shawnee for the second leg of today's Duathlon. Another snow packed course awaited me which was fine with me. I usually do better in muddy conditions, but I am not that bad on ice. Before the race I was "feeling it" in my legs and very lethargic. I needed some coffee or something. After a little warm-up things started to come together, but it was going to be a hard race especially the road section. No power in the ole legs for anything needing power today. Cat 3's were off at 2:30pm on time which I was very thankful for . Nothing worse than standing still in below freezing conditions. I got off the line well, but had nothing much for anyone going up the climb. Today was going to be about riding my own race and staying within myself. For the first lap I regretted running today's Buffalo Run, but then I remembered one of my goals for 2010. Just have fun racing and do not worry about results. They will come in their own time with enough hard work. Things are looking good for this years BB36. Added classes (10 year age-groups), more cash payout, cool awards, t-shirts, food, music, SWAG, sweet trails, 3 to 6 hours of fun. What more could you ask for? Free Entry you say. Bring a volunteer or volunteer yourself and you get to race for free. Check with me for complete details. Registration opens on 1/15/10. 250 slots available so register early. I have been working on my objectives for 2010. I have always enjoyed the beginning of a year. A time to look back and see where you went and get motivated for a new journey. Goal setting is a big part of this. Make them too hard and you end up disappointed if they are not achieved. Too easy (or for that matter having no goals at all) and you end up just walking through life instead of living life to the fullest. Well at least that is how I look at it. Remember on thing about goals, keep them SMART. Three events are on my promotion list. 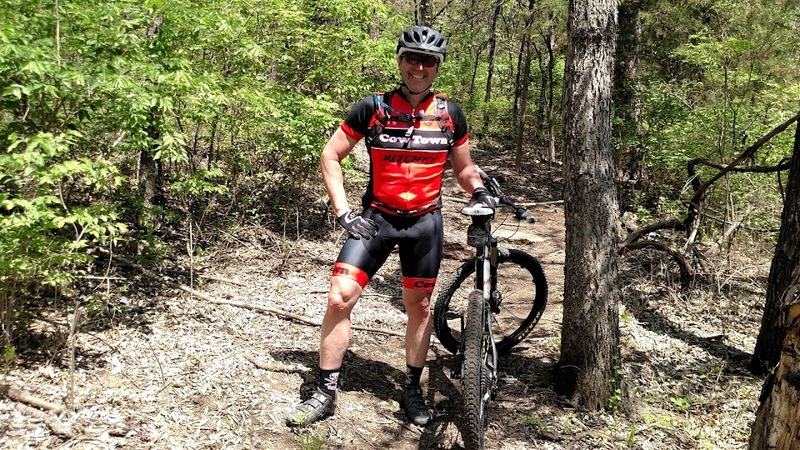 The 8th Annual God's Country Off-Road Duathlon will be held on April 11, 2010. 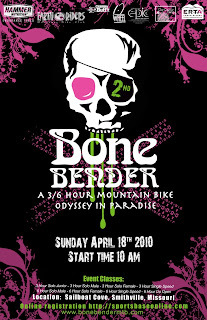 The Bone Bender 3/6 Hour MTB Odyssey returns on April 18, 2010. The last event is really a series. Expect some big things for this years De Stad Cyclocross Van Kansas Series.